PGA Village Golf Club "Quiet Linkside Retreat"
Stay on Perfect Drive for less and enjoy your golf getaway relaxing in this well appointed two-bedroom, two-bath golf villa located in the heart of PGA Village in Port St. Lucie, Florida. The villa overlooks the Twelfth hole on the PGA Golf Club Wanamaker Course, providing a stunning view from both bedrooms and the living area. The screened in porch is the perfect place to rehash your day on the links while you watch golfers chasing the sun as they finish their round. The kitchen and living area (with spacious vaulted ceilings) are well equipped with everything you will need including High Speed Internet Access and HD wide screen television. The master bedroom has a walk in shower and a Roman hot tub to help get you ready for the next day. The guest bedroom has its own bathroom and balcony as well as a separate entrance. Both bedrooms and the living area are equipped with phones and cable T.V. Walk to PGA Golf Club which offers three championship golf courses. The Ryder Course and the Wanamaker Course, designed by Tom Fazio, and The Pete Dye Course, all provide unique features to test your game. Five sets of tees make these distinct courses challenging and fun for golfers of any level. PGA Village also boasts the PGA Learning Center where for one low price you can spend the whole day fine tuning your game. In addition, the 6 hole short game training course is located just steps from the villa. Located on the Treasure Coast, The PGA Village offers access to Dining, Shopping, Entertainment and beautiful beaches. The New York Mets Spring training and Minor league Stadium is 2 miles away. This is the perfect retreat for anyone looking for great golf and ideal location. I'll be happy to help you with information on golf rates and tee times. Click on photo link for an additional photo. My wife and I live 2 hours away. Love to get away whenever possible to relax at PGA Village. Love the Golf courses and PGA Village, beautiful and quiet. Great golf, wonderful pool, relaxing, quiet, pretty views from patio. 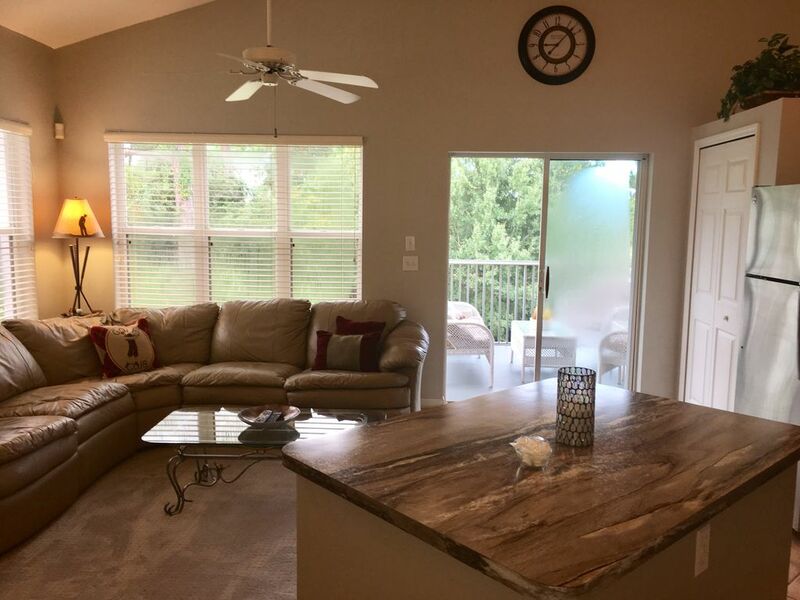 Comfortable leather wrap around couch in Family room and King Size Bed are upgrades from rental furniture found in similar villas on Property. Our villa is only listed on VRBO so we are able to keep it in great shape. Great stay in a 2 bedroom 2 bath condo with golf course views. Overall beautiful condo in a perfect location. Great location. Very clean and comfortable. Wonderful view from the tranquil porch. Owner is very helpful and accessible. Great stay in a wonderful villa! We have stayed in this villa complex the past 5 years and this villa was definitely the best! It was very clean, updated appliances, well stocked kitchen, and comfortable king bed. Also, it has nice golf decor and a great view. Place was perfect for some son and some golf. Owner was flexibile and very responsive. Well equipped and great location. Thank you Jeffrey, Pleasure having you stay. Please visit again! Our stay was absolutely perfect. Very comfortable, everything you need is right here. Nicely decorated in golf theme. Close to pool and clubhouse. Didn’t want to leave! Thank you very much Kent. Chrissy & Billy R.
Thank you Chrissy. I enjoyed corresponding with you. Thank you for taking such great care of our villa. - (Nearby), Baseball (Met's Spring training), Theatre, Bowling, Roller Skating.